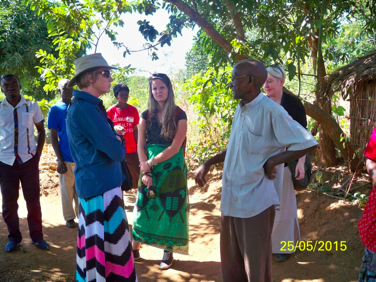 We arrived home safely after a productive trip to Malawi for the month of May. 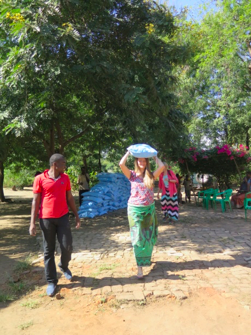 This was Sarah’s first adventure to Malawi and she really rolled her sleeves up, wrapped her chitenji around her waist and got to work. Karen and I were very impressed and so were the locals. 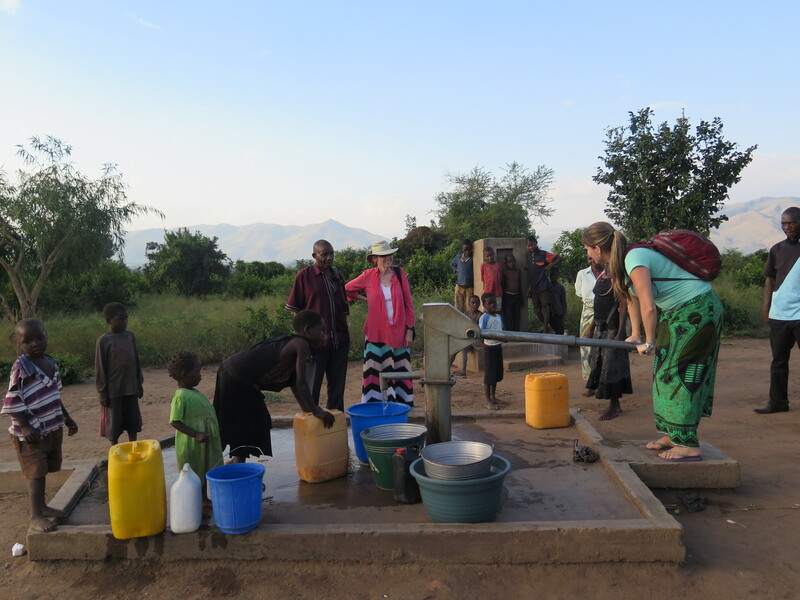 Sarah is continuing to stay on in Malawi until the middle of July and I know the teams will appreciate her assistance. Our first stop was to visit our North Project. We had a bit of a set back since Sarah’s luggage didn’t make it and neither did one of our bags destined for our South Project. Fortunately after a few days both bags did appear however, some of Sarah’s items were missing so she has been forced to become a minimalist on this trip. The teams are not only focussing on providing the biosand filter to families, they are also working hard to educate villagers on proper sanitation and hygiene. 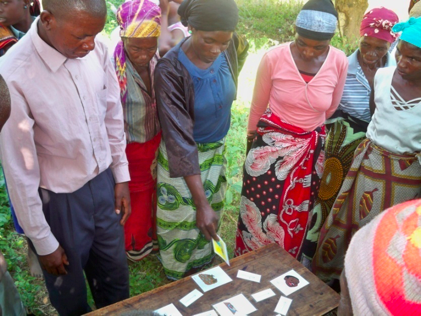 Our Community Health Promoters use pictures to explain how germs are carried and how proper sanitation and hygiene can eliminate germs and stop their families from getting sick. In each of the three Project areas we met with the team members and prior to the meeting we did fun activities to break the ice and help us remember everyone’s name. One of our meetings was held in the grass under a tree. The site where our shelter is located and where we usually meet was extremely busy. 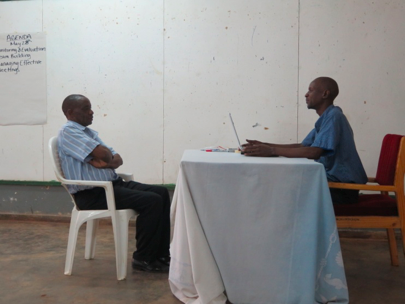 A group of volunteer doctors, nurses and medical assistants from the US had come to set up a mobile clinic for 2 weeks. They were inundated by hundreds of people needing to be seen so we opted for this quiet area so we could hear each other speak. 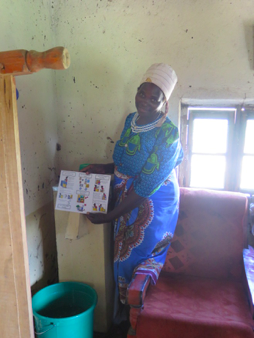 During our household visits, while our Biosand Filter Implementer and our Community Health Promoter observed, one of the young mothers showed us how she uses her filter. The women have to carry very heavy loads of wood on their heads to use for fires to cook and boil contaminated water. We are happy that we are not only providing safe water for mom’s and their families but we are also reducing the need for firewood to boil water and in turn reducing deforestation . One of our beneficiaries is telling me how he appreciates the filter and he also appreciates that we don’t just bring in a machine for him to use and then leave and not come back like so many other organizations. He is happy that we keep in touch with him to see how his filter is working and if he needs any help. That conversation reinforced for me the need to continue to concentrate on our follow-up program with the beneficiaries of the filters. We are very grateful to Nazir and Rosie Bhura with All Canadian Printing of Calgary who generously donated a gift of laminated instruction sheets. Their website is www.allcanadianprinting.com. 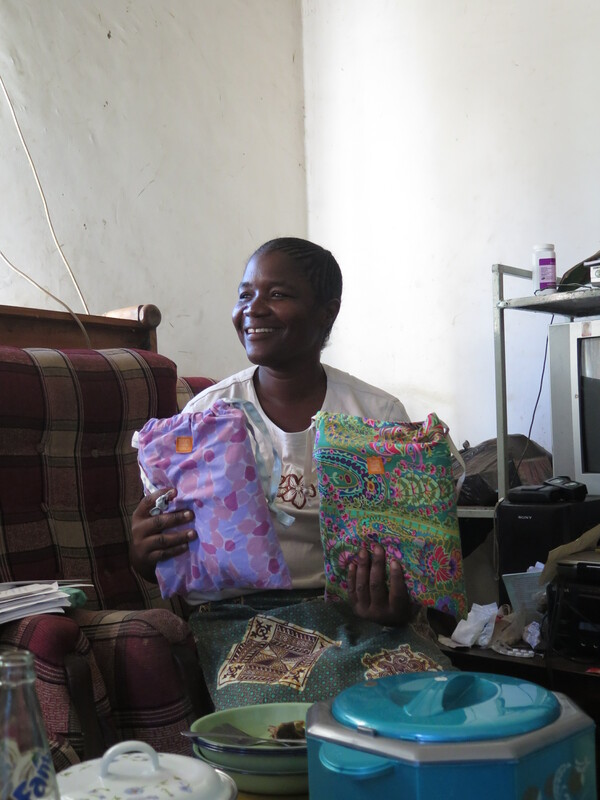 The sheets with colourful pictures describe how the beneficiaries should care for their filters. It is very encouraging to see that we have several volunteers who have joined the Project in each region to help teach proper sanitation and hygiene in their villages. They also help prepare the sand and gravel for installation in the filter. We distributed gifts of T-shirts, identification cards, soaps, hand lotions and mosquito nets to our Volunteer Community Health Promoters. The team members also received new T-shirts, soaps, lotions and equipment to help them do their jobs. 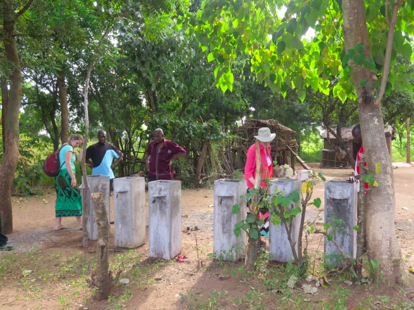 Here we are inspecting the newly constructed filters in the South Project. The South team has moved their construction area to a new village near the clinic. We are contemplating the need for a larger factory site where the filters can be protected from the elements and from any damage that could occur to them. 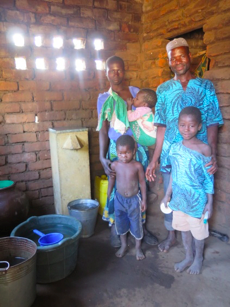 Here is a picture of a happy family making use of their filter to keep their children healthy. It was difficult to see all of the devastation from the flooding in the South. Many of the homes and crops were destroyed and toilets have collapsed. 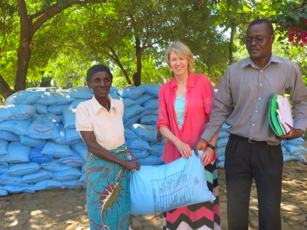 The villagers affected by the flooding were very happy to receive maize seed and flour from us. Thank you to everyone who contributed to the relief fund. 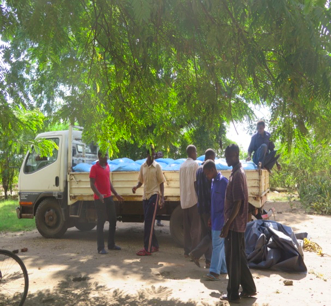 We helped distribute bags of maize flour from the first truck load. Our next stop was Mfera clinic. Hilda and Rex Bwanausi live at the clinic. 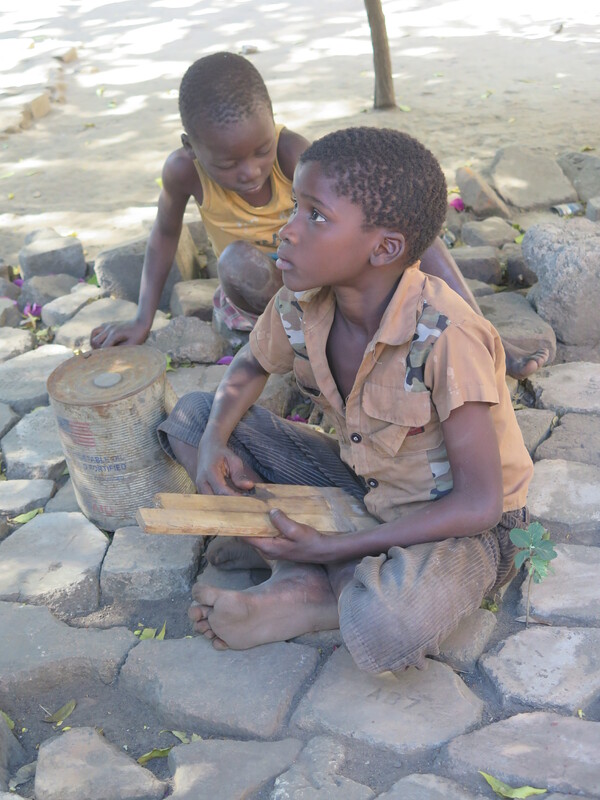 Hlilda is a teacher in a nearby school and Rex is a Medical Services Officer at the hospital in Chikwawa. 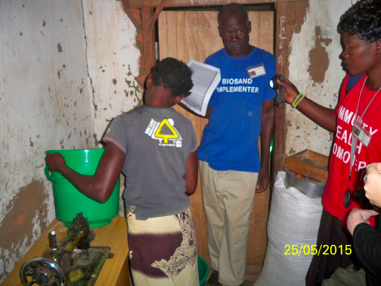 Rex has been instrumental in promoting the biosand filter with the villagers and teaching them how it works. On behalf of Hilda and Rex we would like to thank the women who volunteer their time to sew kits for Days For Girls in Calgary. Their website is www.daysforgirls.org. 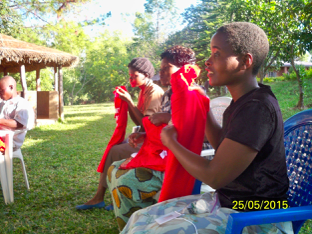 We took over 25 hygiene kits for girls to continue going to school when they are menstruating. We also gave 10 postpartum kits to the clinic. 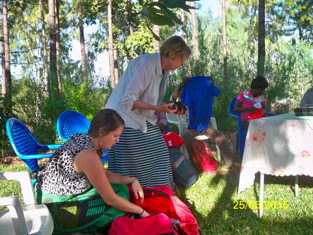 Hilda and Rex will distribute the kits to the girls at Hilda’s school. 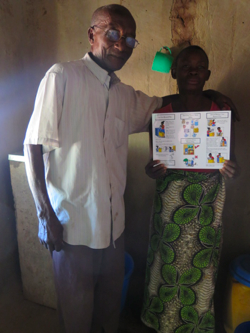 Along with the kits we took laminated sheets to teach both boys and girls about the process of reproduction and their bodies. Hilda told us she will send pictures of the girls receiving their kits. 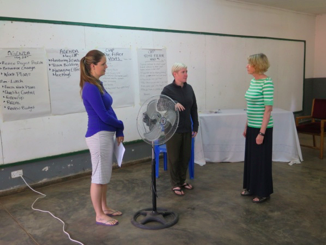 Our final 3 days in Malawi were spent with our Field Coordinators going through Project Management, Work Plans, Behaviour Change, Conflict Resolution, Leadership skills, Team Building and discussions about future goals and direction. 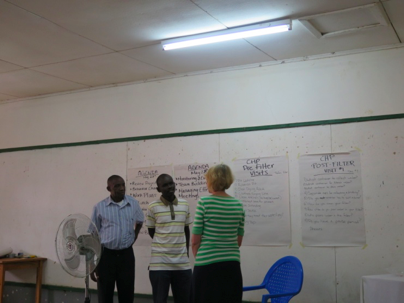 We had the Field Coordinators participate in several role playing scenarios to help them deal with problematic behaviours that may arise with their team members and we role played follow-up visits to households that have filters. It was a very productive month and it is rewarding to see the strides the teams have made over the past year. 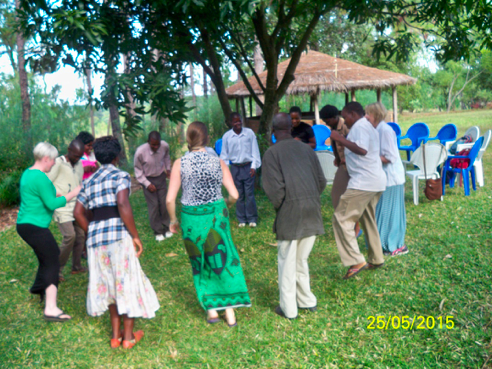 The training was well received and the Field Coordinators appreciated the chance to get together to discuss issues. There are several areas that I can see for improvement and growth. The South and Central teams really are in need of proper shelters to make their filters and to have a secure storage area for their equipment. All three areas need another mold to produce the filters more efficiently so that they are able to spend more days in the field following up on installed filters. We would very much like to expand our distribution of filters to villages that are using water from the lakes or rivers. 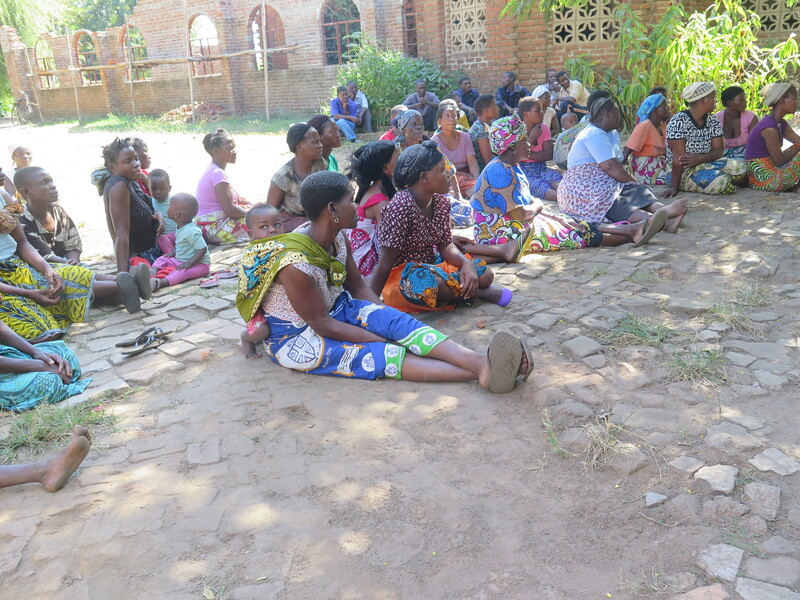 There are cases of cholera every year during the rainy season. Any help that you may be able to provide would be greatly appreciated. Please click HERE .